The Stone House faces south over a tranquil seawater cove with uninterrupted views to 14th century Rossbrin Castle and then out to Roaring Water Bay and Carberry's 100 isles. Located on THE WILD ATLANTIC WAY. Set in its own grounds and frontline to the sea on 2 acres the house is furnished to a very high standard with a contemporary scheme and sleeps six comfortably. It is perfect for a relaxing holiday and if you are on a first visit to Ireland the perfect base for touring. The house is spacious, light and well equipped. Schull is 5km away with its pretty shops and delis and of course lovely little pubs and great food. Local golf courses at Bantry and Skibbereen. The area is well served with gourmet restaurants as well as numerous cafes, some at wonderful beauty spots. Schull in the summer months is renowned for its sailing regattas, festivals and seafood. It is possible to moor a boat in Rossbrin cove which you can view from the house. Rossbrin Cove is an easy one and half hours drive from Cork city. Check out the five star reviews from previous guests to get a flavour of what you can look forward to. My heart skipped a beat when I saw Rossbrin Cove and castle for the first time. I was working as a TV producer in London and had travelled the world with work so this place felt world class in terms of the location, wildlife and people ! I am still fortunate enough to travel between London and Rossbrin Cove frequently which has allowed me to indulge my passions for walking, cooking, roaming around the various farmers markets here and most importantly spend quality time with friends and family. It is just wonderful to share this beautiful house with others so they can experience all of this for themselves with their loved ones. So easy to get to either Ballydehob or Schull within 10 minutes in the car. So many good restaurants/ cafes/ pubs (some with great music) and of course the artisan farmers markets in Schull, Skibbereen and Bantry for organic and local produce. Wonderful walks all along the coast suitable for all abilities and ages. Peaceful location overlooking calm Rossbrin Cove with views to 14th century castle ruin and islands in Roaring Water bay. Heaven ! En-suite bathroom on ground floor En-suite bathroom upstairs One family bathroom upstairs (shower) One guest cloakroom/toilet ground floor. All bed linen and towels/tea towels included. Bring Own Beach Towels as not provided. Easy walking routes from the house and along the Mizen coastline. Golf 18 holes in Skibbereen and Bantry. Horse riding 15 minutes walk from house at Ballycumisk. Garden trails and open days to see some of the best gardens in Ireland. Fishing. Sailing school in Schull including sea kayaking/canoeing. May Jazz festival in Ballydehob. Farmers markets in Schull, Skibbereen and Bantry all year round. The views from the house are stunning. Sunrise and sunset reflect off the water. It is well appointed with plenty of space indoor and out. We enjoyed meals at the outdoor table, even in September. It is so private and enjoyable to have horses as neighbours The walking right out of the house and in the surrounding area was a highlight. We will stay here again. What a wonderful place - we truly enjoyed it and the nice welcome bottle of wine! Magnificent sunsets on all but one evening. Very comfortable, tasteful, well equipped and classy home all throughout. One can tell that this is a much loved place. Lots of good information of surrounding areas and beyond. Made friends with the horses in the field next to us - probably because we shared our apples and pears... People are very friendly and helpful. Fabulous dinner at Budds - highly recommended. Great excursions from our wonderful home base. We definitely hope/plan on coming back! Ps - If we ever were in the market of buying a home in Ireland we’d be looking for a place like this one. Fabulous house and beautiful location. We thoroughly enjoyed our week. What a perfect house. Lizzie gave us a warm welcome and saw us off safely on our last morning. She is charming. Thank you, Angela, for your excellent communications and your for your warm hospitality. It was a relaxing week in lake very West Cork. Thankyou Kathy and we hope you will all come back to Rossbrin again soon ! Very smart and well equipped, just what we were looking for. As above, only criticism, was that sofas were not very comfortable and en suite shower kept slipping back to bath mode rather than shower mode. We will always remember this place as one of the happiest times of our 20 year marriage. The perfect vacation place. 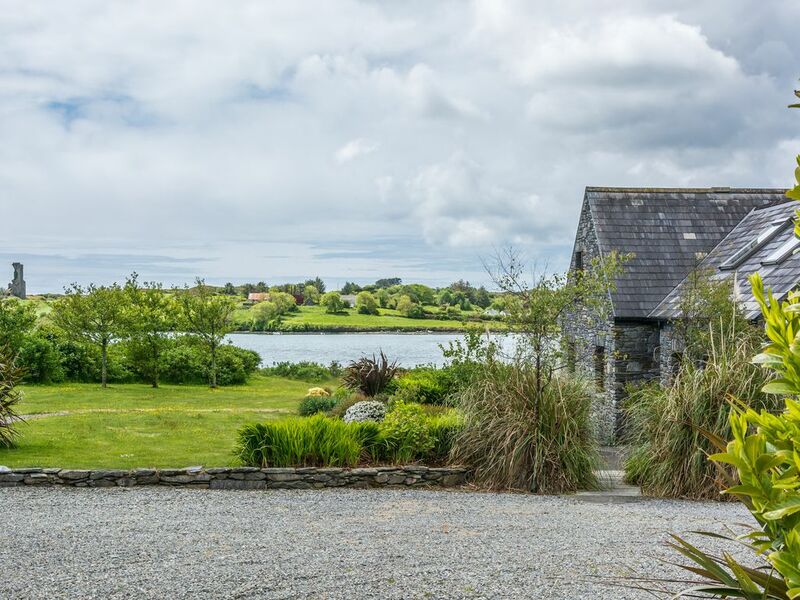 Having traveled extensively we found Stone House in West Cork to be our ideal vacation spot, and we plan to return. The house is lovely in its setting and accommodations, and unique because it is not just one-kind of vacation but provides a variety: from relaxing down time on the patio over the meadow and beyond that a cove off the ocean and an ancient tower---beautiful and contemplative; numerous opportunities for leisurely walks on quiet country lanes or more strenuous hiking with spectacular views; nearby friendly villages with shops, pubs,galleries and restaurants. The open,airy home appealed both to one spouse who appreciates design and taste and another spouse who wants to be able to live in the home like home. Stone House was everything it was said to be and more. Ellen and Walt Nashville Tn. You are away from it all, but conveniently close to wherever you want to go in southern Ireland. The house was very clean and had nearly everything we needed for a week's stay. The setting was wonderful and we had great sunset views. Thank you Angela for being a great host! The Mizen peninsula ( on THE WILD ATLANTIC WAY) offers so much to the visitor and at Ireland's most south-westerly point,is renowned not only for the beautiful coastline and rugged landscape but also the prospect of a warm and inviting welcome to sample the artisan quality food, sailing regattas and festivals, irish pubs galore, song and dance, peace and quiet, coastal walks, sea kayaking,canoeing, horse riding, swimming. In fact everything is here for a perfect holiday for all ages. The abundance of local farmers markets promote A Taste Of West Cork. We are fortunate to have some of the best food producers in Ireland here on our doorstep. Please read the reviews from visitors past to get a sense of the Heaven on Earth a stay in Rossbrin can offer. A tour of the Mizen Ring gives you the chance to visit Ballydehob, Schull, Goleen, Bantry and beyond to Skibbereen, Baltimore and by boat to the islands Cape Clear/Sherkin/Heir. Kerry is a day out option over the Healy Pass. One small dog is considered on booking and only with PRIOR CONSENT from owner at time of booking. CANCELLATION of booking for any reason. We will only refund payments made if another booking can be taken for the same amount and dates otherwise there is no refund. We advise Holiday Cancellation Insurance as necessary.